In Stock. Only 2 Left! Dynamat Xtreme is a patented, lightweight elastomeric butyl and aluminum constrained-layer vibrational damper. The Xtreme Series adapts and conforms easily to sheet metal and other hard metals vehicles are made of. This material works best for temperature ranges between 14° – 140° but can withstand ranges between -65° - 300°. The Xtreme License Plate Kit is great for improving the overall sound quality in your vehicle by cutting out unwanted road noise. It is typically used on vehicles to reduce vibrations and rattles on the license plate. This kit includes one 4" x 10" sheet, four self adhesive neoprene foam strips, and 1 decorative license plate frame. Remove dust, grease, moisture, and other foreign matter from the license plate. Now it’s time to peel off the release liner and start applying. The easiest way to apply is to bend the mat slightly and attach it along its shortest edge. Press the mat tightly into place and eliminate unwanted air pockets. There is no need for heating the material, for best results the application surface should not be below room temperature. A color that compliments the main color of the product. Search for the accessory for your favorite NFL sports team! Represent your favorite team and search for a college sports themed accessory for your vehicle. Search for the accessory for your favorite MLB sports team! The type of material that the item is made of. This was very good purchase. Works great. Makes a world of difference. 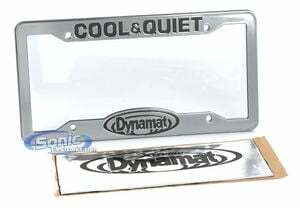 Sound quality its what I'm digging on my ride and thanks to Dynamat Xtreme. I can't hear that annoying rattling license plate. I bought this for one sole reason: to get rid of that annoying license plate rattle that people hear when you drive down the street. The design is pretty cool, the only problem I had was getting the license plate to fit inside of it. If the frame was a little bigger I would have had a better time installing it, but it eventually fit. The other issue that I have is that it sort of covers my tags up, if there is some way to avoid that in future designs that would be awesome. Other than that, this helps a lot! it does the trick make that tag quit rattling with one of these 5 stars because it works great and is simple to use !! Its a good product.. good value for money..
Definitely worth the money, stops that annoying l plate raffle dead.. Comes with a slice of dynamat and some rubber stuff.. All you need.. So cheap for what you get.. However it says "I have better sound..." Which is not what is photographed when I bought it.. It was suppose to say "cool and quite" but oh wel.. This product does exactly what it says, i got 2 15s in my 2011 Kia Sorento and it surprisingly stop my license plate from rattling.